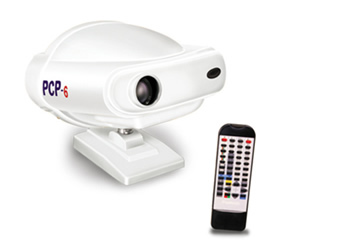 Compact Plantech PCP-6 projector offer clear sharp images with convenient remote contro; and fast simple chart swapping. Plantech PCP-6 auto chart projector provides clear & sharp image projection in a compact device that features cordless remote control. Select among 30 different eye test charts at a rate of 0.2 seconds per frame for fast, efficient test procedures. The versatile masking capabilities of PCP-6 unit allows projection of a single character at a time. The horizontal axis of the projector can be adjusted to guarantee a perfectly positioned projection on the screen. This top of the line PCP-6 model features both fully automated, programmable and random access chart selection together with one touch masking capability built in to the cordless remote control unit. The PCP – 6 ,with it’s variable focous lens, provides accomplished with unrivaled speed (0.2”) and projection quality to make visual actuity testing quicker and more accurate than ever before.